How the UK Weather Affects Coatings on External Facades. The UK is prone to all weather conditions and in certain instances, these can be extreme. These weather conditions can cause damage to external coatings to facades on buildings throughout Britain and Northern Ireland. We look at how the UK Weather affects Coatings on the nation’s buildings and facades. The following diagram, provided by the Met Office, shows the typical airflows in the UK. 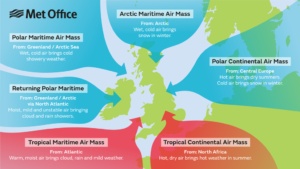 The diagram shows the air masses that affect the UK. There are six different masses that have an effect, each bringing different conditions. The UK’s weather is dictated by a jet stream. The position of the jet stream determines the type of weather that we can expect. When the polar front jet is situated significantly to the south of the UK we will experience colder than average weather. When the polar front jet is situated to the north of the UK we will experience warmer than average weather. When the polar front jet is situated over the UK we will experience wetter and windier than average weather. When the polar front jet has a large amplification then cold air will travel further south than average and warm air will travel further north than average. The position of the UK and fluctuating state of jet stream means that we experience extremes in weather conditions. These extremes contribute to the life expectancy of building materials and coatings used on commercial and industrial projects. Further considerations are micro and macro climates where small parts of a location may experience differing weather conditions compared to its surroundings. During heat spells, building materials can expand during the daytime and contract during the colder night time temperatures. The constant flexing can affect how the coating performs and protects. Energy waves caused by solar energy can help contribute to the breakdown of the chemicals or resins that hold the coating and underlying material together. High levels of heat can also cause an increase in molecule vibrations which will also cause the bonds to break over time. The weakness in the bonds is a factor in the breakdown of coatings. Quite often certain elevations may be affected as they are sun facing. The sun, over time, can fade powder coated windows and doors and cladded sheets found on industrial units. Wet weather, in general, can cause long term damage when coatings start to fail. Water is constantly in our surrounding air in the form of humidity. Coatings used on external facades should be water resistant. Water in any form can penetrate microscopic holes and defects in existing coatings. The Wind can drive the water into almost any external face. Water can actually be drawn into the coating in certain instances. Water can collect and pool in areas and cause an acceleration of coating failure. Often blisters can appear where water has penetrated the coating and forced the coating to swell. Where the existing coating may be thicker in an area than the surrounding, it may result in spot areas being evident. Cold- Freeze and thaw cycles affect the coating similar to the way heat and wet conditions affect the movement of molecules. This can increase the likelihood of paint breakdown. Assessing Environmental conditions can be a confusing and complex task. Two or more different conditions could be affecting the same building at the same time, for instance, at the top and bottom of a high story building, temperatures, wind speed, and direction, sunlight can all have differing impacts. The Society for protective Coatings and International Standards Organization have defined weather environments in an attempt to help paint manufacturers to specify coatings depending on conditions in specific areas. 0 Dry interiors where structural steel is embedded in concrete, encased in masonry, or protected by a membrane or noncorrosive contact type fireproofing. 1A Interior, normally dry (or temporary protection). Very mild. 1B Exterior, normally dry. Coatings may be subject to exposure to sunlight. 2A Frequently wet by fresh water. The coating may be subject to condensation, splash, spray or frequent immersion. 2B Frequently wet by salt water. The coating may be subject to condensation, splash, spray, or frequent immersion. 2C Fresh water immersion. The coating is constantly submerged. 2D Salt water immersion. The coating is constantly submerged. 3D Chemical atmospheric exposure, the presence of mild solvent fumes. Intermittent contact with aliphatic hydrocarbon solvents (e.g., mineral spirits), lower alcohols, glycols, etc. 3E Chemical atmospheric exposure, severe. Includes oxidizing chemicals, fumes from strong solvents, extreme pHs, or combinations of these with high temperatures. Both Standards are similar in the way they start from mild conditions and increase to the harshest environments. The harshest environments involve both salt and moisture and these are the main influencers in the corrosion process on external facades. Choosing the correct coating system is vital when carrying out maintenance projects. Assessing external areas can be a challenge. All areas of the UK are subject to differing weather conditions. What material that the coating is to be applied to. Is it steel, aluminium, previously powder coated or other? The Location. Is it close to the coast or lake or river? Is it close to an industrial area, busy roads or airport? Is the building heated internally? We work closely with all paint manufacturers to provide solutions top façade refurbishment projects. Coating systems are available with a life expectancy of 5-20 years. We are able to survey site and propose a solution for a coating system suitable for the environment. If you require any further information, we would be happy to discuss your requirements further please contact us.